Mother Nature has been good to us this last week, and our fertile fields are producing like crazy. When she’s generous with her sunshine and just the right amount of rain, we get to be generous with our CSA shares, which we love. That’s one of the big benefits of a CSA, if the fields and the walk-in are overflowing, the baskets will be too. This is the good end of that farming gamble, so enjoy! This week our members received the following in the shares. Amounts vary between full and half shares, but here's a run down of what was inside! The peas, both sugar snap & English, are popping up all over the plants, and our crew is harvesting as fast as they can. Pea pods are difficult to spot on the plant, so picking them is tedious work. Not only do we want to harvest them at their peak so that they are sweet, we also need to keep picking the plant clean so that it will keep producing more pods. Basically we’re tricking the plant into thinking that it hasn’t produced any of it seeds, which is what the peas are, so it keeps making them. So yes, we have very confused pea plants, and we like it that way. Members had a taste of the sugar snaps last week, but this week they're getting them by the pound! Clancy, Avis & Steven’s daughter, and I went on a road trip this past weekend and she de-strung and handed me sugar snaps while I drove - I was in heaven! They are the perfect snack while driving, and they are so sweet the kids will think they are just green candy. Of course they are great cooked with dinner or on a salad, but I prefer them raw and by the handful. Anyone else? English peas are the perfect way to really get back in touch with your food, and to earn your dinner. As silly as this sounds, some people don’t even realize that peas actually grow inside a pod, and that they have to be shucked. They don’t grow inside that plastic bag in the freezer section, you’ve got to work for them. Steven says they are worth their weight in gold, considering all that goes into getting them on your plate. The easiest way to free those sweet pea pals is to gently squeeze the pod, popping it open, and then you scoop the peas out into a bowl. Be careful and have your bowl right in front of you — they will pop out and roll away in an effort to save themselves, but don’t let them escape — they are so tasty! If you have kids, put them to work; it’s a great chore and a learning tool as well. And if you’re like me, and you don’t have any little helpers, pour yourself a glass of wine and get to shucking. The radishes are coming in fast, so our members received more this week, than last. We’re growing a mixture of Easter Egg (the purple, pink & white ones), D’Avignon (the long red & white ones), and Rover (the classic red globes). I leave the greens, but you’ll want to snip those off pretty quickly if you have some. The greens pull nutrients from the radish, which is essentially their root, which makes the radish fade quicker. This is true of the Red Ace beets we have as well. If you're enjoying beets this summer, whether ours or not, please remember, you can eat those beet greens, so just sauté them like you would kale or chard and enjoy the whole plant. Loving the color of this Easter Egg radish - they are almost to pretty to eat! Speaking of beets! Those poor guys have been through some tough times this spring. All the rain nearly drowned them, and some of the baby plants were completely covered in soil after all the storms. Luckily they are tough and have soldiered on. The one thing is, they are all over the place size wise because some stayed above ground and some were buried and had to, well, beat their way back up through the soil. So Ryan thinned the herd, so to speak, and gave the rest some room. There will be more beets to come, but we wanted to make some space, so our members got to benefit a little early. This beautiful Red Ace beet had the longest root I've ever seen! The spinach is super fresh and so tasty! And the Summer Crisp lettuce is delicious. And the spring onions are lovely and pungent, just like they should be. Asparagus, what is it good for? Beets, what are they good for? 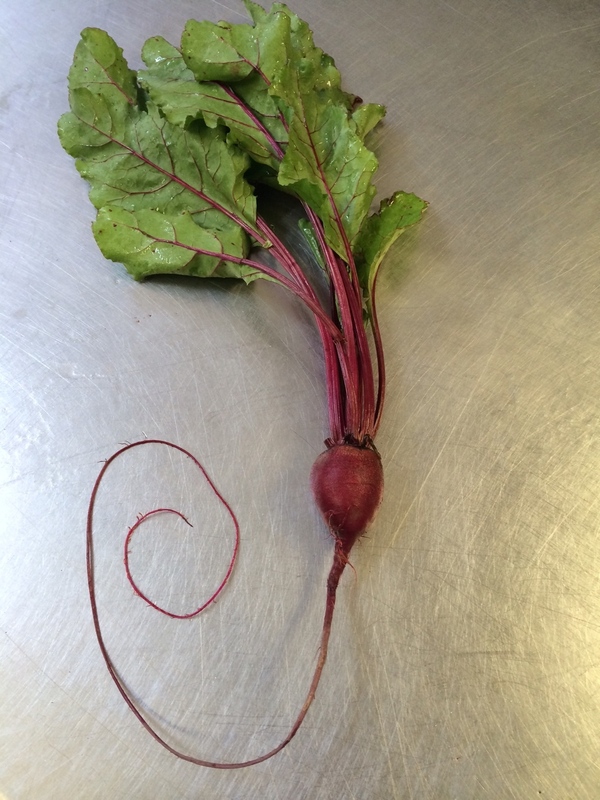 Wild beets originated in North Africa and were eventually cultivated by the Romans. While most people cook them, raw beets are super sweet and tasty. They are so sweet in fact, that most of the sugar you’ll find in the store is made from beets. The greens are actually more nutritious than the root, containing calcium, iron, and vitamins A & C. The beet itself is high in folic acid, fiber and potassium. They are known to stimulate detoxification of the liver, and are even believed to have anticancer properties. The pigment that gives beets their rich color, betacyanin, is a powerful cancer fighting agent. Radishes, what are they good for? Radishes were first cultivated in Egypt for the Pharaohs and were highly esteemed in Greece, where they were carried on golden platters as vegetable sacrifices to the Gods. No, seriously! They are a great source of folic acid & potassium, and the greens have tons of Vitamin C. They too, are cancer fighters, and they help maintain a healthy gallbladder & liver! Last week's farm lunch! Everything on the plate came from our fertile fields. It was a great meal that we all washed down with a heaping slice of Mom's Strawberry open-faced pie!